Just a quick reminder for everyone, don’t forget that you can see all the photos on all of my posts full size by clicking on them and they will open up in a new window. 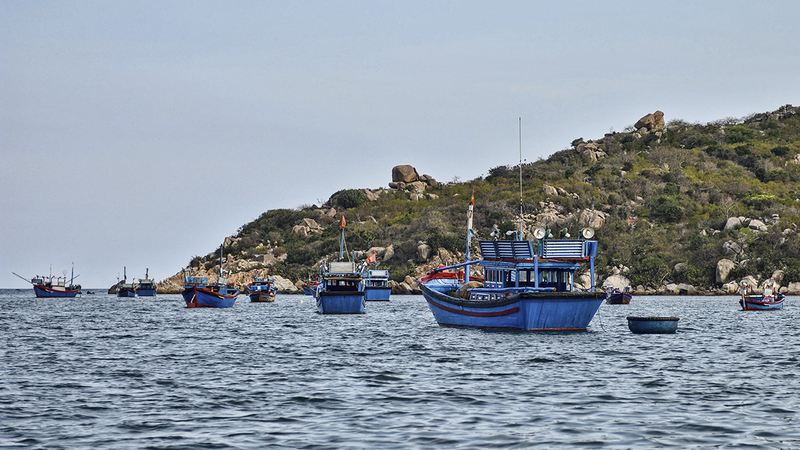 An excellent place to visit, Vinh Hy Bay, Viet Nam. It’s been over a year, and a lot has happened since I first started posting to my blog. Sometimes I wrote more frequently than others, but no matter how much time has passed since this day, I will never forget it. I had never really experienced riding on motorcycles and motorbikes before, so riding on the back of one in Viet Nam definitely turned out to be a life changer for me. I had already vowed to myself that I would one day come back and tour my way by motorbike around the region, and that day will be coming soon. But, enough about that, let’s get back to this day and this ride. 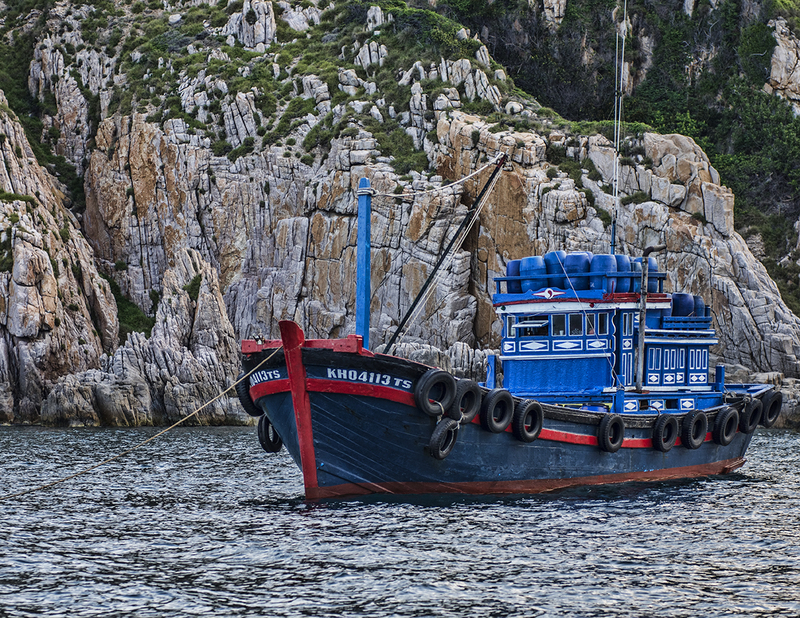 One of the things I had come to love about the Phan Rang area was the extremely colorful, blue fishing boats that seemed to be everywhere! We had seen them earlier in the morning, and there were many more here too, at Vinh Hy Bay. If I had one wish that day though, it would have been for me to be driving the motorbike so I could have stopped to photograph the amazing landscape we were traveling through. 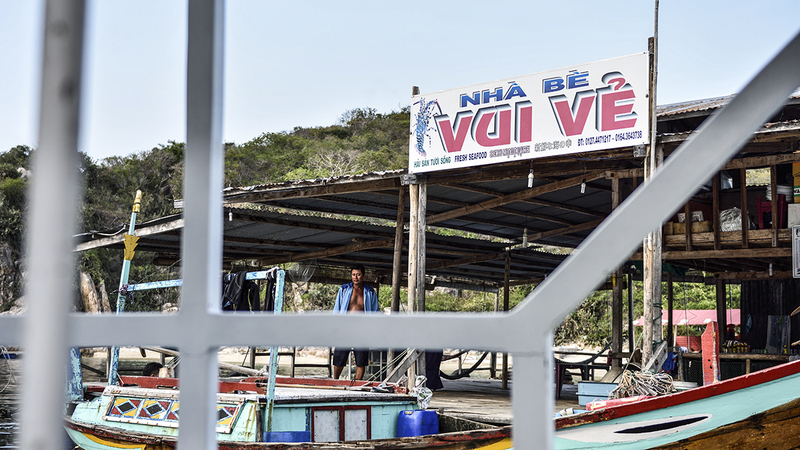 Stopping for a bite to eat at Vinh Hy Bay. If only I could share it with everyone here that reads my blog, instead of reading my words which cannot describe the beauty I saw while driving along the road to the bay, that day. There were countless salt fields with huge piles of sea salt raked up and drying in the sun on one side. The coast, and it’s limestone formations with a myriad of earthy, beautiful colors bordered the other side of the road, and majestic hills were in front of us. The road was a twisty, winding road that slowly elevated through the hills on one side, then swiftly dropped down to the bay on the other. Floating restaurant on Vinh Hy Bay. 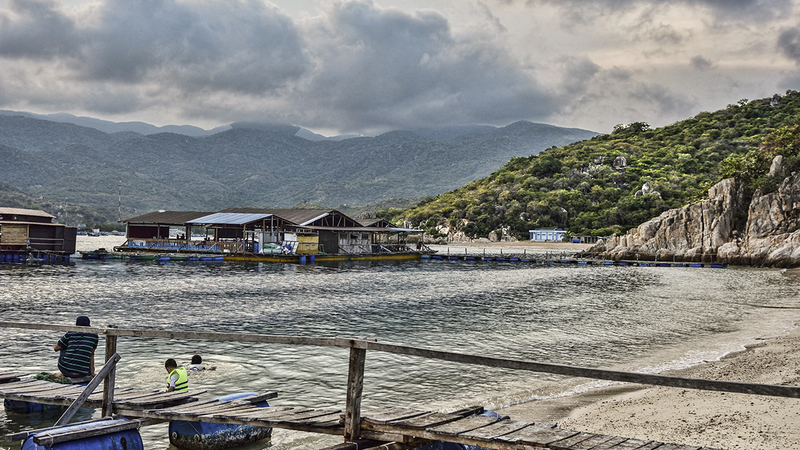 Vinh Hy Bay is about 40 kilometers from Phan Rang, but is well worth the time it takes to travel there. I really loved this small bay and it’s sleepy little village that wraps around it’s shores. It is a must see in my book, and several people on Tripadvisor seem to agree with me, giving it 4 1/2 stars. I also highly recommend stopping and eating at the small little floating restaurant on the water. The food was great, and so were the friendly people that run the small place. You can see from my video, and hear from my voice that this was another one of those unforgettable experiences on this trip of a lifetime, for me! 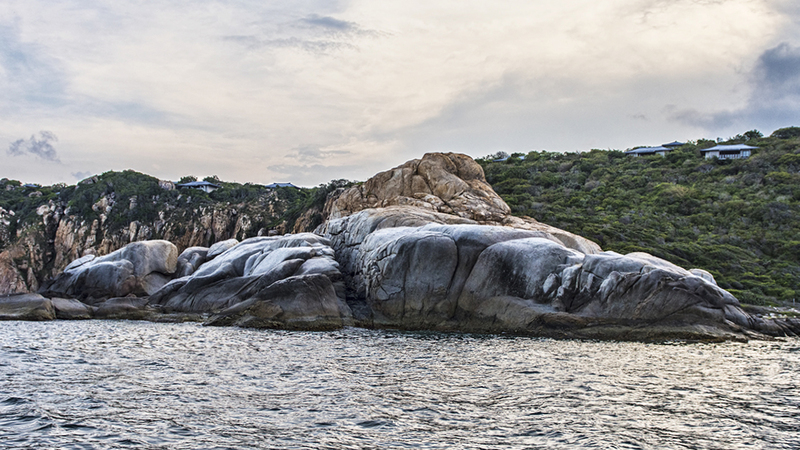 Another shot of the beauty of Vinh Hy Bay. It would be hard for me to decide what part of the day was my favorite, all of it was special. From a beautiful sunrise and relaxing swim first thing in the morning, to the pottery lessons, watching the traditional clothing being made, and visiting with Ba Moi at his vineyard, I would be hard pressed to choose…I wouldn’t have left anything out. But, as I started this post out, between the beautiful drive to this village, the boat trip out to the mouth of the bay, and the succulent meal at the very simple cafe and it’s equally basic accommodations, this was the ONLY way to end the day! I will never forget riding back to Phan Rang, the goosebumps that took over my arm when I was looking back on the day, and the teary eyes I get, even now, when thinking how lucky I was to have had such an unbelievable experience as that day was. I truly hope everyone can have moments in their lives equal to any of the moments I had on that day…because if we could all live in those moments always, life would be a treasure equal to no other! 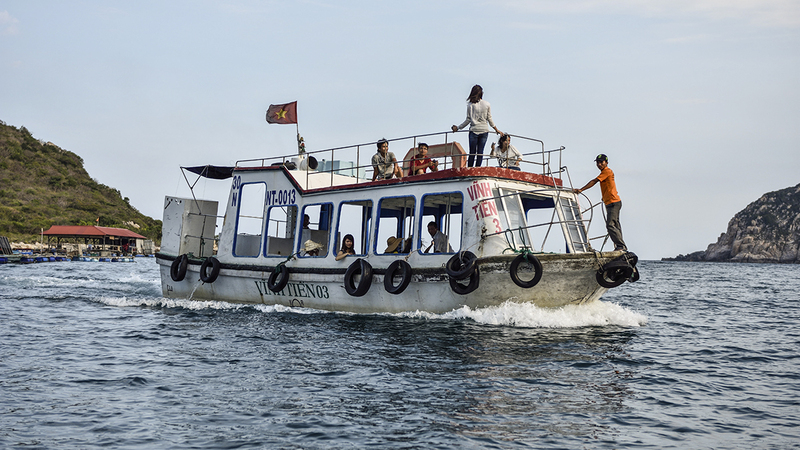 Just one of those amazingly carefree days cruising around Vinh Hy Bay in Viet Nam!